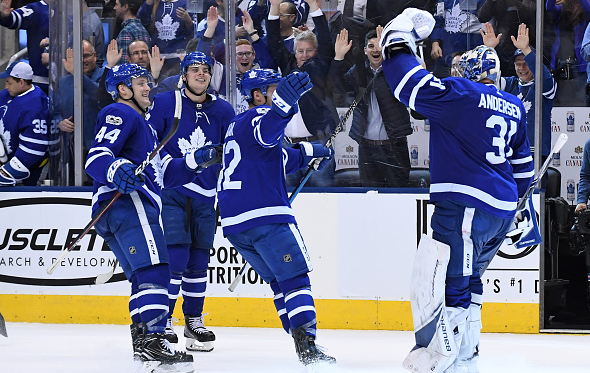 Is the Toronto Maple Leafs’ Style Sustainable? A lot of team analysis will begin with shot attempts percentage, aka their Corsi or CF%. In terms of just shot attempts there is reason for concern because they are a below 50% shot share team. This has historically been the best predictor of future success. So, such a mediocre CF% is at least cause for some concern. The reason I only said “some” concern is that Corsi is obviously not perfect. And a legitimate criticism of Corsi is it lacks context by treating all shots equally. This is why we can turn to expected goals for additional information. What expected goals does is weight every shot for the how likely it is to go in the net. And when shots are weighted for danger (XGF%) the Leafs have controlled 51.63% of them. This ranks them as a top 10 skating team in the NHL (as of the 40 game mark). Usually the Corsi and the expected goals line up very closely. However, the Leafs appear to be the exception to this rule. The Leafs XG outperforms their corsi by 1.86% which is the 4th highest mark in the league. The only difference between these two numbers is that one accounts for shot quality while the other does not. Therefore, the amount you XG outperforms your Corsi by can be a proxy for “shot quality”. By these definitions the Leafs have been the 4th best shot quality team in the league. This has also helped keep them afloat while they are being out-shot more often than not. The concept of shot quality at a team level seems very intuitive: simply stop taking low percentage shots and you can dramatically improve your shot quality at a team level. This is why there has been some great discussion on Leafs twitter about whether the Leafs can or should seek to be a team that drives shot quality rather than quality. So I wanted to see if it was sustainable to get out shot but still win the shot quality battle. To do this I’m going to look at results I found based on the past 2 seasons of data to answer the question, can or should the Leafs be a shot quality team? To start here is the repeat-ability of what I call XG Above Corsi. Neither of these results are promising to any team looking to outperform their shot metrics consistently. On a simple year to year basis (using the past 2 seasons) the correlation between shot quality is an R squared of 0.1529. This is a disheartening number and suggests that this number is about 85% randomness. With this we can conclude that there is almost no relationship between a teams shot quality on a year to year basis. The numbers bounce around pretty much nonsensically. Good quality teams randomly seem to see it crater or sometimes get even better, but in the end it appears to be primarily randomness. This suggests the Leafs shot quality is more based in luck than anything else, which begins to suggest the Leafs current style is unsustainable. Just in case I was missing something, I created another chart to see if there was more to “shot quality”. So I created the graph to the right, representing in season repeat-ability. This takes the first 20 or so games of a teams season and compares them to the final 3/4 of the season. The results were incredibly similar to the year to year correlations. With in season repeat-ability I got an R squared of 0.1509. This again would indicate that in season shot quality is about 85% randomness. Meaning not only is this gap due to extreme variance going into next year, but it may also randomly peak or crater in the final half of this season. So the gap between the two numbers or “shot quality” as it’s currently defined is about as noisy as PDO. Knowing that the gap between Corsi and XG is almost unpredictable, let’s figure out which number is more indicative of the Leafs true talent. Is their true talent closer to the 17th best Corsi team, or the 10th best expected goals team. To get an idea of which one means more going forward I tested the predictive value of both. I did this by checking which number after the first 20 games predicted the final half of the season more effectively. Here are the results. Above is the nail in the coffin for any hope that the Leafs current results are optimal. CF% has an R squared of 0.1018 while XGF% only has an R squared of 0.0763. It seems intuitive that shots weighted for danger net would provide more predictive value, however it just simply isn’t the case. Corsi is more predictive of a teams true talent, meaning winning on volume is still king in today’s NHL. All in all there is very little evidence to suggest the Leafs specializing in “shot quality” over shot quantity is sustainable. Corsi is still a better indicator of future success than XG, and the gap between the two is largely random. The logical conclusion is the Leafs are probably closer to the 17th best team in the league than the 10th. None of this is to say the team is currently bad, but just don’t trick yourself into thinking they are great using XG or “shot quality”. Because in the end winning on quality is still not as sustainable or predictive as winning on quantity. Next Post: Is There Any Substance To The Detroit Red Wings?